Hari studies the Genetics lesson of the day. This made sense; Hari had just instructed me when he and his father had picked me up at the train station that I should call his father uncle. This was the rule in India; everyone called their real aunts and uncles by the Hindi (or Telugu or whatever) words for those relations, and so the English words were used for all other elders. To me, it seemed like a little bit of a betrayal to my real relatives in the United States, but I got used to it in time, particularly after I figured out that older people, who usually have the most photogenic faces, were more likely to let me take their picture if I greeted them with Namasté, Auntie or Namasté, Uncle. Charminar two days before Ramazan, Hyderabad. Haris mother was waiting for us at the gate at the entrance to the balcony surrounding the terrace. Namasté, she murmured back with a smile. Haris mother had long graying hair, and a friendly face; she walked with a stoop that made her look up at the world. Hari gave me a tour of the house: the sitting room in one of the entryways that would serve as my bedroom during my stay; the dining room; his bedroom; his parents bedroom; two bathrooms: one with a western toilet, one Indian, where is set into the floor, so that you squat while using it. And finally, there was the kitchen. 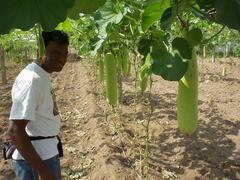 Hari with zucchini-like vegetables hanging from trellises. You can just take a peek now, but its better if you dont go in until after youve washed, said Hari. The kitchen was the nucleus of the house; and it was where Haris mother could be found most of the time. In one corner there was the temple area, where there were numerous icons of various Hindu deities, before which both of Haris parents  but most notably his mother  would offer food and perform pujas. The kitchen was also important for the Tammana household for the simple fact that food was important. Months previous to this visit, back in the offices of Affymetrix, where Hari and I both worked, I had been warned that my skinny frame would be a cause for concern. 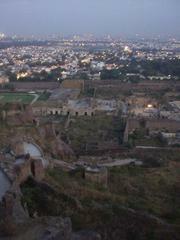 The city of Hyderabad as seen from Golconda Fort. My mom will take one look at you and say, that boy isnt healthy, he needs to eat more, Hari told me. However, as we sat down for the first brunch (We were losing too much time eating breakfast and lunch, said Hari, So weve decided to just eat one meal at eleven so we can go out and do things during the day), I found out that Hari, tactfully, had issued warnings both ways: he told me I would have to eat a lot, and told his parents not to feed me too much. It was kind of a big deal, but we got my parents to treat you like a normal person at the table, and not as a guest. If you were a real guest, they would have been getting up and serving you all the time and making sure you always had enough food, he said. Being South Indians, every meal involved a great deal of rice, although sometimes at dinner there would be a few of the thin unleavened breads called chapatis. The first dinner was rice, chapatis, a potato curry, a cauliflower curry, and curd  yoghurt  to finish it off. I tried to make a good impression; I ate as much as I could, and took seconds and thirds when offered. When it was finished, I felt positively gorged; I was quite certain that I could go for the next 48 hours without being hungry. The last few bites of food seemed to still be stuck at the base of my esophagus, waiting for room to clear to proceed to my stomach. 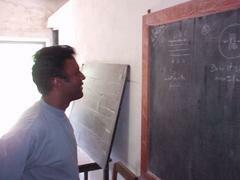 Haris mother said something to him in Telugu. Hari translated. She says that she was pleased that you ate enough. Not too much, but enough, said Hari. The next day Hari and Preethi, his wife, went out shopping, and I went with them to see the town. Hari drove. I was mildly concerned at first: perhaps after five years in America, he had forgotten how to weave in between all the rickshaws and scooters? I made a point of not talking to Hari any more than necessary for the first five or ten minutes of driving, but by that time it became apparent that all was well, and his old reflexes had returned. We went first to Hollywood shoes, the place to buy shoes in Hyderabad. It was packed like a going out of business sale, although Hari inquired and there was nothing of the kind going on, except possibly some extra business from the approach of Id, the end of Ramazan (for whatever linguistic reason  Urdu versus Arabic, perhaps  the holiday is pronounced Ramazan instead of Ramadan in Hyderabad). Hyderabad is almost half Muslim, and about half of the women in Hollywood shoes were wearing black burkhas; I found this eerie, that many of the people in the room were hiding their faces. I felt like an excluded heathen in their midst. After a few shoe purchases, we walked around Abids, the main upscale shopping area of Hyderabad, a whistle sounded, and there was a sudden rush of people, mostly wearing white knit caps that identified them as Muslims. The next morning, before brunch was ready, I read the remainder of Peter Hesslers River Town, which describes Hesslers stint in the Peace Corps in Fuling, a small Chinese town (by local standards: 200,000 people) in Sichuan Province. It was well put together, honest and simple and yet very engaging. Superficially, Hessler didnt do very much in Fuling. He ate, slept, taught English and English Literature, and learned the Chinese language and talked to people. But his slow dive into the Chinese language and culture is fascinating. At first he is very clearly the foreigner, always in a different category. As he became able to converse with his colleagues, his students, and the local people in Chinese, however, he was able to hear about (and relate to his readers) the problems of recent Chinese history  the Cultural Revolution and the Third Line project to put Chinese military industry in remote areas, for example  as well as their daily lives and their hopes for the future. By end of his two-year tour, Hessler was, in everything but appearance, half-Chinese, half-American. Or rather, he was two people: the Chinese teacher Ho Wei by day, and the American writer Peter Hessler by night, when he wrote out what had happened to Ho Wei during the day. Travel books tend to make me want to emulate the author. Theroux made me ride on trains and talk to people: easily accomplished. Dalrymple made me realize the history that was deep in every place, and made me want to follow a famous historical trail, like he followed Marco Polo. Im thinking of following Evariste Regis Huc, a Franciscan Monk who went from Peking to Lhasa around 1850, and wrote about it: more effort, but possible. If I had taken the entire nine months I allotted for travel and spent it in once place, however, I would only have a piece of the depth  and the language, which is so much of what constitutes a people and a culture  that Hessler soaked up in two years in one provincial town of western China. But the survey comes first, the dive later; before Hessler chose China, he spent a lot of time backpacking around Europe and Asia. After brunch, Hari, Preethi and I visited Charminar (Char is four, minar is the same as minaret), a major landmark in the center of Hyderabad, built in 1591 by Mohammed Quli Qutb Shah. It is, unsurprisingly, composed of four minarets and contains a tiny mosque; the massive Mecca Masjid next to it holds up to 10,000 worshippers and is a major focal point for Islam in Hyderabad. Hari and Preethi went to shop for pearls; I went along to see the old city. Krishna, the Tammanas driver, drove the car this time, which was good. If he hadnt, we would have been severely inconvenienced, since the Charminar area was awash with people; it was difficult to drive through and parking was out of the question. Haris father is a banker and we went first to meet one of his colleagues at the Charminar branch of the bank; he knew a good pearl wholesaler who would sell individual necklaces to a few lucky well-connected people. The most remarkable thing about the bank was the guard, who was carrying a fifty-caliber double barreled shotgun that had to be at least seventy years old. Everything else was normal: people waiting in line, a vault, a back office where we met the manager; but every time I glanced at the guard I kept thinking of Don Oberdorfers story of the Maharajas sons hunting the elephant and imagining that gun in their hands. If it could stop an elephant, I guess it would work on bank robbers. Hari and Preethi went to the pearl wholesalers, and I followed them in order to know where it was, in a back alley several winding turns from the main street; then I went back out to visit the nearby Laad Bazaar where my guidebook assured me I could find just about everything from the tackiest merchandise to the most exquisite perfumes, jewels and fabrics. My image of a bazaar was of the darkened medieval souqs of Damascus and Istanbul, with interesting goods to photograph, and so I brought my camera. Soon, however, I gave up on any thought of using my camera and mostly concentrated on protecting it, tucked under my arm like a halfback making a run for the endzone  for I was set afloat in one of the biggest and densest crowds I have ever seen. The pre-Id shopping that had swollen Hollywood Shoes made for a flood of people at Charminar: it was the Islamic equivalent of December 23rd shopping, and this was where Muslims shopped. The only comparison I can think of is Halloween in San Francisco; although I havent visited it myself, Mardi Gras would probably also compete. Unlike Market Street or the Latin Quarter, however, I stuck out in the crowd; I was two heads taller than anyone else there, and very much not a Muslim. There is nothing more unnerving than bumping into someone in a dense crowd, turning around, and then realizing that you probably just elbowed that black-hooded woman in the chest. But the crowd was so dense that such small infractions were forgiven if they were even noticed. Everyone was elbowing everyone else, and trying to bargain for underwear and wrist bangles at the same time. Beggars, emboldened by the crowd, occasionally grabbed my arm demanding rupees. There was no clear path, and with each step I had to concentrate on not running into anyone. People on Bajaj scooters (duplicates from a Vespa design), horns blaring, shoved their way through the part of the crowd that was on what would normally be a street. I found a side street where men were sewing patterns onto cloth that would eventually be made eventually into salwar kameez. After catching my breath, I made the charge back to the pearl wholesalers. As I was returning, a police officer charged past me, shoving his way through the crowd, and then yelled at a flower seller angrily, and hit him on the head. The flower seller looked pained, then chagrined, although it was not apparent that he had done any wrong, nor how the policeman could have seen what it was if that was the case. The police officer turned and walked away. The thought of trying to control this crowd was sobering; it was easy to imagine some similar spark igniting a firestorm of communal violence that has occurred between Hindus and Muslims during and since Partition. After I found with Hari and Preethi, we went to a nearby Muslim restaurant and ate haleem, a traditional Ramazan dish made from wheat, goat, and ghee (clarified butter) and pounded and cooked for eight hours. Hari had grown up vegetarian, but had been perennially curious about haleem. I broke my own vegetarian habit for the cultural experience. It was a gloppy concoction, with the slimy texture of oyster, and a taste of meaty oatmeal. I stopped after one bite; the taste did not encourage any future ventures into carnivory. I forget how exactly Krishna knew where to pick us up, but I do remember the staggering change upon entering the car; it was like entering a television. The noise, the jostling, the dodge and weave just to walk down the street, were suddenly replaced by silence and the sights out the car window; I instantly went from being a participant to an observer. The car only moved at a crawl, but I was now free to watch the world roll by like an MTV video: beggars, merchants, old devout men in kurta pajamas and white knit caps, and burkas, burkas, burkas. We went to visit Haris family farm the next day, which they had purchased partly as an investment, and partly because they wanted to be able to occasionally get out into the countryside. Indians arent big into stock markets and mutual funds; purchasing real estate was a more popular option. Their land was seven acres, about an hour drive out of Hyderabad. Haris father went over the details: they had bought the land and then spent the equivalent of 14,000 U.S. dollars drilling wells so that it would have enough water to irrigate it and grow rice. However, between the urban focus of the Andhra government and two years of drought, there was only enough electricity and water for two acres of rice. A man who had been managing it for them had tried planting groundnuts (as Indians call peanuts), on some of the remaining land, but all of them had died before harvest. Haris father pointed out that it was just too hard to find good management, unless there are relatives to do the job, and all three of his sons were in the United States; he was going to sell the land soon. We went to visit a working farm later on that day. Ashok Reddy was the son of a nearby farmer who had helped the Tammanas in clearing their land after they had bought it. He paid a visit on his motorcycle, and after we had finished surveying the Tammana farm, we went to the Reddy farm. The Reddys well was a sixty foot square cube of soil and rock that had been removed from the earth. A tube ran to the bottom of the well, connected to an electrical box with a wild bush of wires protruding. Hari translated from Ashoks Telugu that they kept the pump running continuously, partly because they needed the water, and partly so they could keep men in the well, digging it ever deeper. A man herded a large group of goats past us, and a short conversation passed between Ahsok and Hari. Damn, this guy is so rich! He has six hundred goats, said Hari. The thought of Hari with six hundred goats in his apartment in Albany, California, leaped to my mind, and I tried not to laugh. We took a walk around and picked some hanging vegetables, similar to zucchini. On the walk back out towards our car, we met Ashoks father, Rami Reddy. Although Ashok spoke no English, he wore western clothes and appeared to be the son of a wealthy landowner. Rami, however, did not actually appear to be a wealthy landowner, except for the obvious deference that was given to him by the people around him. His skin was dark from the sun, and he wore only a tank top and lunghi. His teeth were broken as if he had been in many fights, and he was carrying a small chipped scythe, which both gave him a menacing air; but as he talked to the Tammanas and to his son, it was obvious that he was just a very serious, hard working man. It was obvious from the size of the farm and the number of laborers around that this was an entirely optional activity for Rami. I asked how many cattle there were, and how long it took for each one. Twenty one cattle. It takes five minutes for each one, said Hari, after an exchange with Rami. After we got in the car and started in on the drive back to Hyderabad, Haris father continued to speak about Rami. I queried some more on the facts of the Tammana farm. There was not enough water for seven acres of rice, but they could grow less water-intensive vegetables and dairy cattle, but it required more labor and supervision than rice, and someone reliable (read: related) to take them in to town for sale. I asked how much money that would net; about 1000 rupees a day for each dairy and vegetables: a little less than fourteen thousand dollars a year. It would be a good investment, but due to the difficulty in finding someone to run it, they had decided that it would be better to just sell the land to someone who would actually live there and run it. 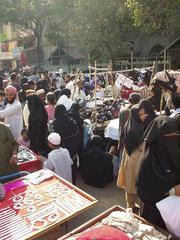 December 6th was Ramazan; about 50% of Hyderabad is Muslim, but about 90% of stores and restaurants close for the day. I took a rickshaw into town, alone; I went shopping at the one store that was still open for a kurta pajama, a traditional Indian dress. When I went to try one on, they sent an employee into the dressing room with me to help me try it on. I wondered if such assistance was standard, or if they thought that I, as a westerner, wouldnt know how to put on a kurta. I just went along with it. I went to Peoples Park, which had a gate that was partly closed, but appeared to have had the lock broken. Other people were walking in and out, so I did the same. The park was full of children playing, and families were scattered across the grass. A group of five boys followed me, all about thirteen or fourteen years old. I ignored them. After a few moments, two said Hello!, one said Thank you!, one said My name is Amit!, and the last asked, Where you from?. I walked for a few more paces. They followed, presumably having run out of English to try out on me. Then they stopped. I waved and kept walking, circling the park until I was in a more remote corner. I sat down at a picnic bench and pulled out my guidebook to figure out what else there was to see in Hyderabad. An old man hovered around me for a few minutes, and then made his approach. It was a reasonable guess, but I was still mildly surprised that he didnt guess Australian or French; there are many more of them than Americans in India. But then he told me that he had three children, two in Philadelphia working for Pfizer, and another working with computers in Chicago. I used to work for Andhra forestry department, you see? he said. He tugged on a card in his wallet until it was free; it showed him, twenty years younger, in a forestry outfit. I asked him about local forests, and he showed me the preserve where he used to work on my Lonely Planet map of Andhra Pradesh. After that we ran out of things to talk about; his English wasnt great, which made conversation difficult. I found Lumbini Park (named after the birthplace of Buddha, not an Indian mafia boss) on the map of Hyderabad; it was bigger, and on the water. I went there and walked around, as the sun set. There was a musical water fountain, and people were gathering half an hour before a show was set to begin. A nature walk turned out to be a thirty foot long paved path with bamboo planted around it. At the end of the park, on the water, there was an outdoor dance club pumping out a recent Bollywood hit song. Slightly disappointed, I walked out to the street and bought a chocolate ice cream cone from a street vendor. As I was munching on it, three young men, about twenty years old, approached me. They asked me where I was from. I told them. Is it possible that we can have your autograph? asked one of them, holding out a pencil and a scrap of paper. I thought for a moment that this must be a scam of some kind. The innocent looks on their faces, however, belied the thought. I signed the piece of paper and handed it back, and then they looked like they wanted to ask me something, but werent sure what it was exactly. I asked them about themselves; they were all mathematics students at Osmania University, the large local school. They asked me my profession, and I told them software (better not to complicate things with law school). Their eyes widened, as if I had told them I was a National Geographic photographer or a Senator; in India, being in software is one of the best jobs imaginable. After that, though, they also ran out of things to say, and took their leave. Later that evening, Hari and I walked to a tailor, where we were both having clothes made. On the way back, a man in the doorway of a house across the street from Haris waved. Haris face lit up. Ah, lets go over and say hello to Uncle, he said. He introduced me to Uncle, who was Dr. Chiranjivi, an oral pathologist who was the father of one of Haris classmates in college. Theyre good, things are almost always good in America, I replied, thinking by way of comparison to India. As the words left my mouth, I realized he was probably talking about the World Trade Center attacks; but as it turned out, he was more concerned with the stock market. No, no, your economy is that getting better? he asked. He spoke with the rapid-fire, heavily accented English that seemed to me more common with middle-aged people, and I had to concentrate to follow him. Well, I just put my money in the stock market, and now Im going to travel for a year and hopefully it will be more after a year, I said. Uncle looked at me with a puzzled expression. Hari repeated what I had said, taking on an accent that was halfway between mine and Uncles. Apparently he had as much trouble with my American drawl as I did with his lilting, staccato Indian English. Uncle, do you know what selling short is? I asked, trying to speak more distinctly. Having dispensed the sum of his investment wisdom, Uncle then asked me about my work. I explained my software-to-law transition. Uncle, hearing this, launched into a rambling account of a Hungarian who had left a promising career as a mathematician to go to law school. Why? Why are you throwing away your talent for mathematics? all these people asked him, related Uncle. The man then made large sums of money as a lawyer in England, and then his thoughts turned again to numbers, so he wrote to Bertrand Russell at Cambridge to try to get in as a lecturer  because you can do that in England and America, unlike India where it is all done by tests  and it wasnt clear if Russell would back him, because if the Hungarian turned out to be a flop, Russell would look bad. But he went ahead and made way for him, and now the Hungarian is a famous professor of mathematics at Cambridge. So, maybe Ill be a professor of bioinformatics some day, I murmured to Hari, and we both chuckled. Uncle, do you know this guy personally? asked Hari. I was wondering the same thing, from the way that he related the story. No, no, this is from the newspaper, said Uncle. Also, Craig Venter was working as an army mortician before he got his Ph.D., he added. Actually I think he was a medic in the Korean War, I said. I also wanted to add that I thought it was even more interesting that he was a professional surf bum before he went on to get his Ph.D. and found Celera, the private company that sequenced the human genome, and for which I had worked, as a contractor from Neomorphic, a year previously. But Uncle wouldnt let a word in edgewise. He was checking people to make sure that they were really dead, that was his job, he said. He treated us to a few more minutes of commentary on Craig Venter before Hari and I took our leave. During my stay, I started reading a copy of Riding the Iron Rooster, another Paul Theroux train travel book that was also about China, that Hari had brought for me from Berkeley, special delivery. As opposed to Hesslers depth-first approach, Theroux surveyed almost the entire country in a one year period, traveling by rail, as usual. He seemed to make a particular point of talking to people about the Cultural Revolution, in particular to those who were persecuted as the stinking ninth, the name given to intellectuals with ideas that didnt agree with Mao, which was most of them (Lest you be consumed with curiosity, the name comes because intellectuals were the last of nine categories of people to be criticized and persecuted; the other eight are landlords, rich peasants, counter-revolutionaries, bad elements, rightists, spies, capitalist roaders, and bourgeois academic authorities. Theres some room for overlap, obviously); the seeming obliteration in Chinese consciousness of Chinese history between the fifth century and 1950; and to the new young capitalists and businessmen. I found it particularly interesting to learn that China had started the one-child policy in the year of my birth, 1976. Theroux pointed out that there was going to be a lot of spoiled children in the upcoming generation, as prosperity and only children coincided, particularly among a people who were accustomed to having lots of children. My original intent was to go to Delhi from Hyderabad. But when I told this to Hari and his father, they thought I was giving short shrift to south India. Youve only been in the South for like five weeks now, and if youre going to be in India for three months, that means youll be spending more time in the North. You should see something more around here, said Hari. I thought about it, and consulted the guidebook. Hampi, the site of an ancient Hindu empire, was on the way. I booked my ticket to there; Delhi would wait another week.